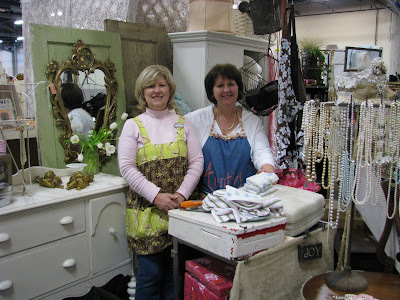 Lisa and I had a great time today visiting the Clark County Antiques Show!! We were not planning to go, but then Lisa called me yesterday evening and said "I need to get out of the house"!! So, of course, I was up for it!! 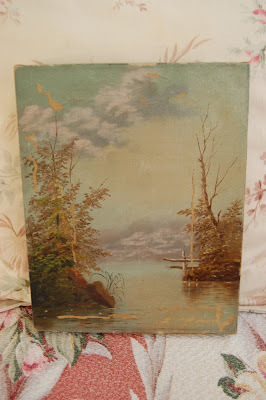 It was so much fun visiting with our friends, and we came home with some cool treasures...!! 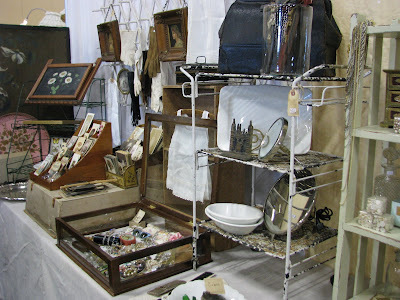 We were feeling thrifty, so all our finds were very inexpensive ~ the best part! 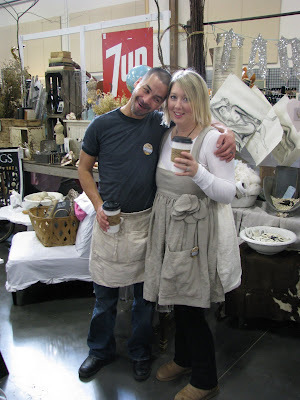 We had a great time visiting with our good friends Joe ~ Barn House and Cindy ~ Tarte, they always put up some beautiful and masterful displays, true eye candy!! See for yourselves!! We always loooove spending time with our sweet friend Joy! She was there with her sister Terri (left), who made her debut at this show...! 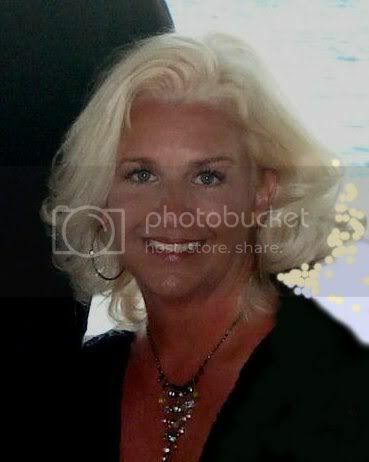 Terri, you are doing a great job! 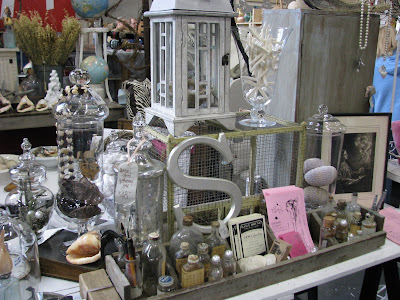 We were very excited to see our friend Susan, her space is always tempting and there are always a ton of things I would gladly take home!! and finally a vintage child's cashing machine ($5)... And it still works!! Sounds like you gals had fun...I'm loving the cash register, what a find! Thanks so much for sharing. 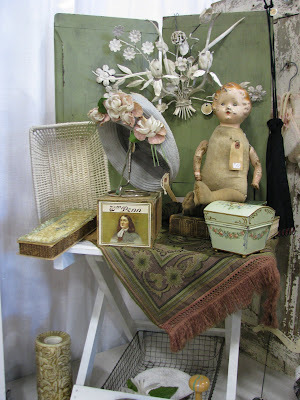 I am in love with that hat box and those vintage knitting bags. Love them! Thanks for sharing such a wonderful post. lucky you, for getting to attend this wonderful show. Thanks for the pictures. Isabel, looks like you found some great treasures. What beautiful displays over there!! And your finds were great! 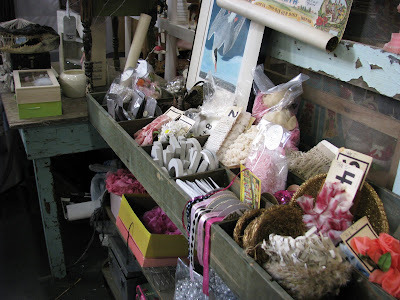 Love the haberdashery assortment, the bags, the hat box, and the cashing machine... they are so beautiful, and pretty inexpensive! Love your finds, Isabel. Looks like a wonderful show! Wow! 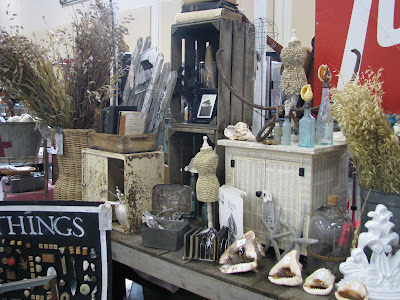 I love all of your finds...they are fabulous! 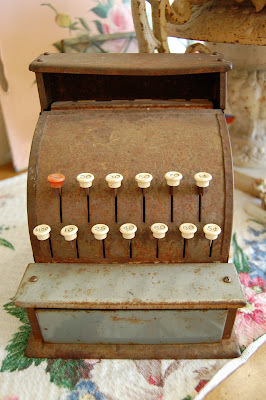 Especially that wee cash register...so fun! 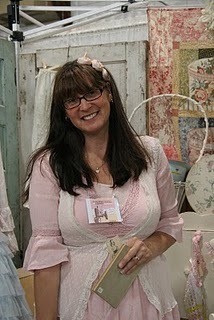 thanks for sharing- your blog is always so wonderful! Hi, popping over from The Paris Apartment. 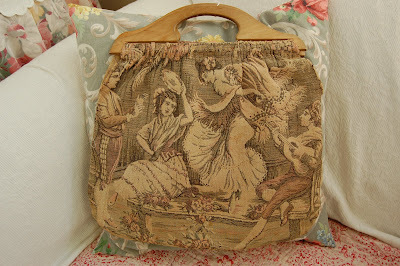 Love your blog and that vintage toile-esque handbag for just $5!! What a steal! Looks like a fun day! Oooooh Fabulous finds! What a great way to "get out of the house!" Take me! Take me! What a fun way to spend a Sunday afternoon! The basket of *stuff* is my favorite... I loved the sweet post about your mother. Great finds! 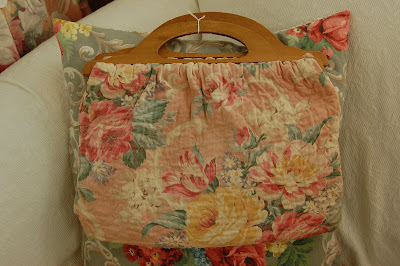 Love the floral vintage knitting bag. 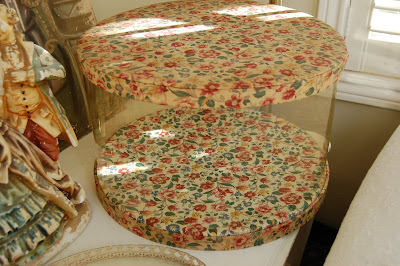 I have been wanting one in a local antique mall booth for for so long now, but can never get myself to pay the $28 they are asking for it, even though it is the most gorgeous rose fabric. You are so lucky finding yours for $5!! What fun! What fun! Thanks for sharing all the really beautiful things. 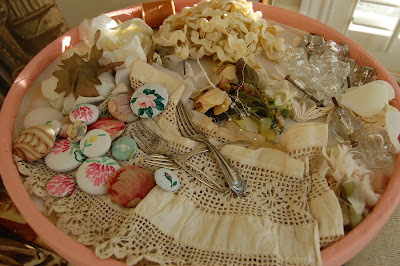 Beautiful fabrics and really unique treasures. Oh my goodness! I think I just found another favorite place to visit. Thank you for the tour. I would love it all. That painting, the cash register... ahhh! I am soooo sorry I didn't get to see you and Lisa on Sunday...I always miss out on the fun! I thought that was you! So nice to "see" you again. What wonderful treasures you've found. 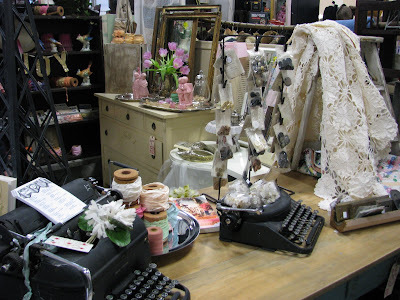 Love the little cash register and the oil painting is lovely! 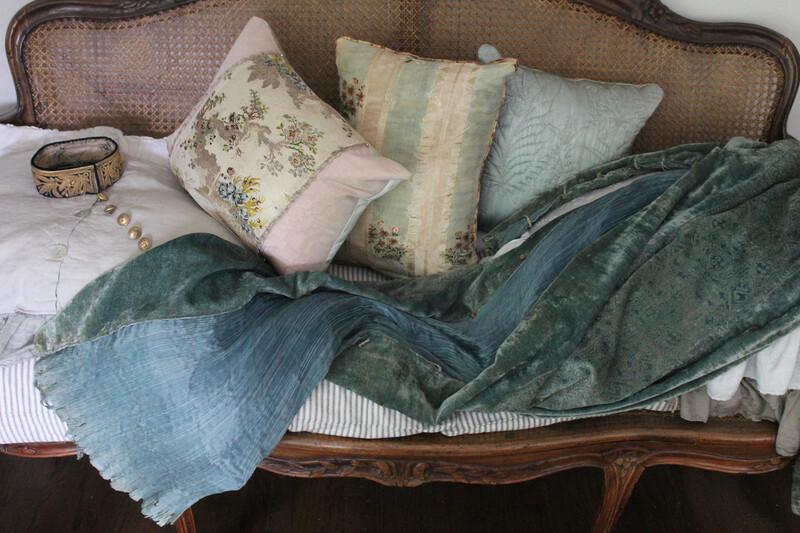 from the fabrics to the little odds and ends, you have wonderful taste in the world of "Shabby chic" and "Vintage" treasures!